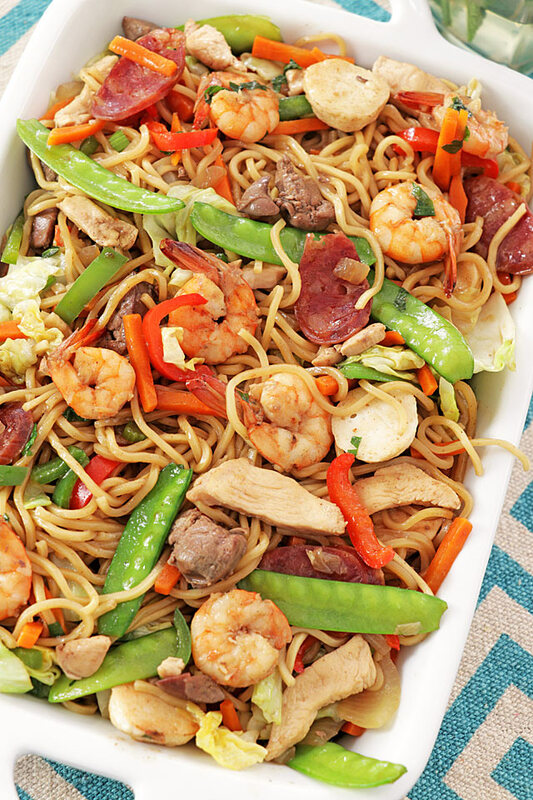 This Pancit Canton will definitely make your occasions extra special. 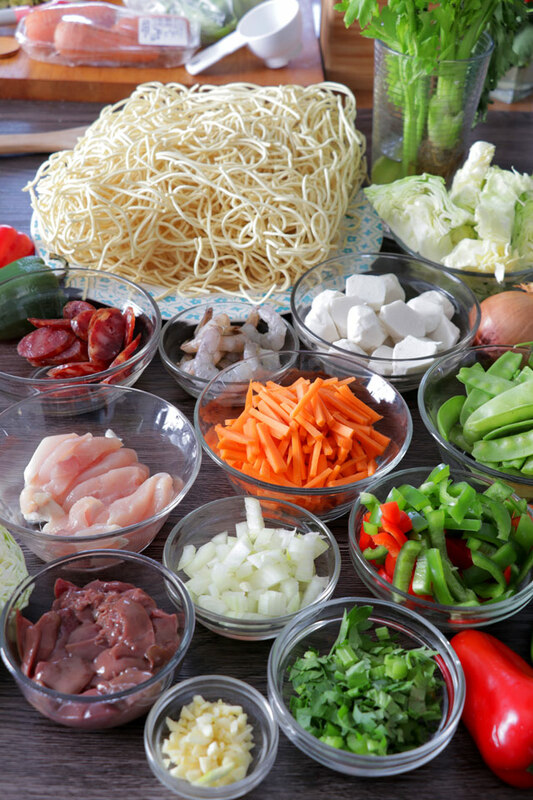 With squid balls, Chinese sausage, and chicken liver in addition to the chicken meat, shrimp and the usual medley of colorful veggies like snow beans, carrots, bell pepper, and cabbage. The good news is, it is also very easy to prepare! Armin loves Pancit Canton. I had to confess though that his first was an instant one. Yep, that pack where you cook the noodles in boiling water (or microwave if you are super lazy to boil water), drain them and little packets of seasonings are added afterward. It was when we were still in Germany and I would hoard packs of instant noodles whenever we go to the Philippines or even just to an Asian store. I think it is a common thing for a Filipino who lives abroad. You crave for home food and even instant noodles would taste like heaven. And I can’t believe that Armin would like them. I was very pleased but I felt guilty as well. Thinking, what kind of food blogger wife am I feeding my husband instant noodles ?? So I cooked him a proper Pancit Canton some days after. Albeit a simple one since I can’t get all the ingredients that I need all at once. But still, he really dug it! Now that I have access to all the stuff needed to make it a lot better, I thought it was time he tries the real deal. This special Pancit canton has squid balls, Chinese sausage, and chicken liver in addition to the chicken meat and shrimp. With a medley of carrots, bell pepper, snow peas, celery and cabbage that makes it colorful and festive. A perfect dish for your special occasions. Pancit Canton is a Filipino stir-fried noodles made from wheat-flour egg noodles. Such noodle is also known as flour sticks. It is usually cooked with shrimp, chicken (or pork) and vegetables. The usual seasoning is soy sauce and calamansi is also squeezed on it before eating. 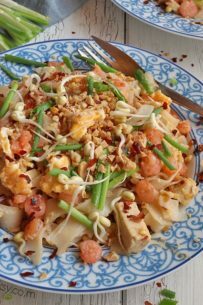 It is a popular dish during birthdays as the long strands of noodles symbolize longevity. But this is only “true” if the noodles are uncut. Filipino pancit canton is very similar to Chinese Lo Mein. Same noodles, same prep, and even the seasoning. Well, from the name itself you can guess where this dish originally came from. 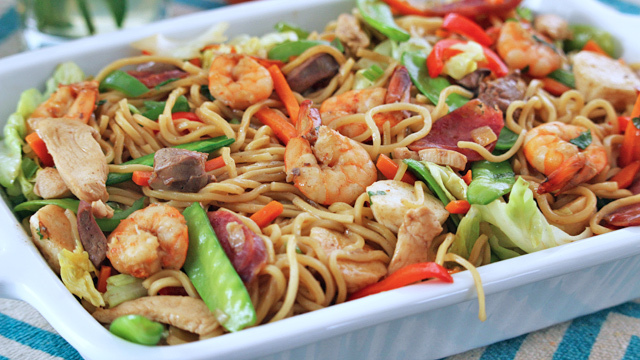 Pancit was brought to the Philippines by the Chinese merchants long before the Spanish came. It is fairly easy to make and is normally done in just 10-15 minutes if using really basic ingredients. 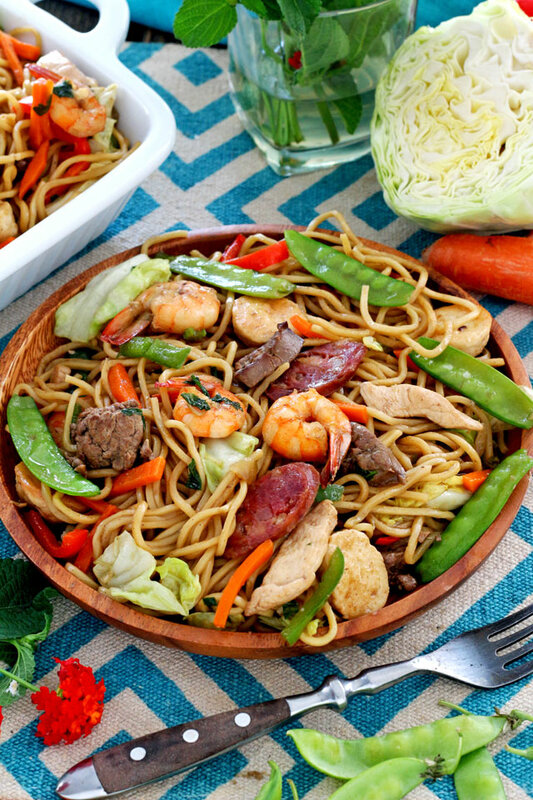 Stir fry the meat (chicken or pork and shrimp). Add the pancit canton noodles and cook until most liquids are absorbed and noodles are cooked al dente. However, if special ingredients are added, some of them might need additional steps or techniques in preparing them. But no worries, it would be nothing complicated. This recipe took about 20 minutes to cook and 10 minutes to prepare the ingredients. It can feed four (4) but can easily be doubled or tripled for a larger crowd. Dry Pancit Canton noodles tend to soak up a lot of liquid. It will also continue absorbing the liquids even after cooking. So be sure to have it saucy and add more water while cooking if needed. Try not to overcook your vegetables so they will not get soggy. Remove them from the liquids while they are still crisp or only half-cooked. They will go on cooking from the remainder of the heat and when they are added back in the last part. I suggest doing all the cutting and chopping before you start and have the seasoning and tools at arm’s length as the cooking process goes rather quickly. We do not want burnt meat or soggy vegetables, do we? Adding a thickener like cornstarch or rice flour will make it easier for the sauce to cling to the noodles. You can replace the squid balls with hard-boiled quail eggs or simply add them to make it more special. I used celery for this recipe but if you want a milder flavor, replace it with parsley. If snow peas are not available, you may also use green beans. You may also add shitake mushrooms, broccoli, and kikiam. 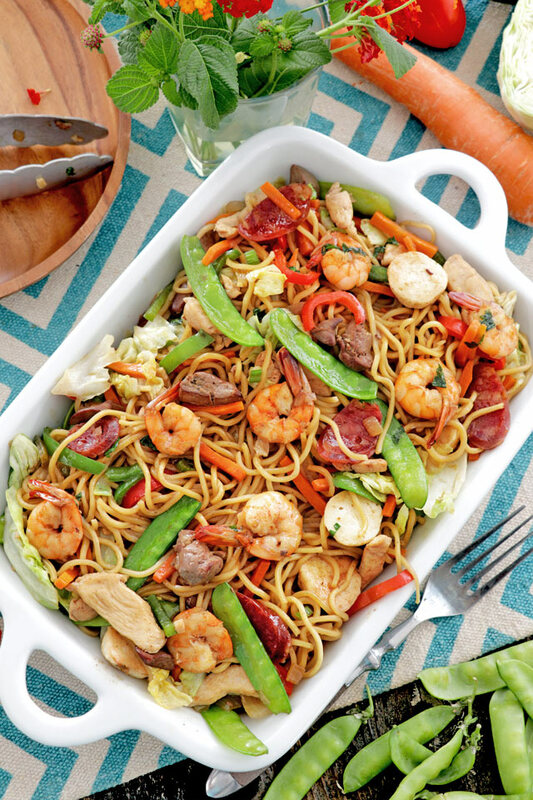 This pancit canton recipe has all the required shrimp, meat and vegetables plus a lot of other good stuff that makes it more special. In a wok or large skillet, heat oil over medium heat. Fry the squid balls until cooked and lightly browned. Remove from oil and set aside. On the same oil, saute garlic and onion until limp and aromatic. Add chicken meat and cook until no longer pink. Add the chicken liver and cook until almost done. Add shrimps and cook until no longer pink. Toss in the Chinese sausage slices and cook for half a minute. Lower heat to low. Pour in soy sauce and oyster sauce and stir until well blended. Add the carrots, bell pepper, and snow peas and celery and mix. Cook for about a minute. Turn up the heat to high and pour in chicken broth and bring to a simmer. Once it simmers, stir in cabbage and cook for a few seconds. Add ground pepper to the liquids. Dissolve the cornstarch in 1 cup of water and add this to the wok and bring to simmer. Add back the meat and vegetables and the squid balls. Season with salt as needed. Stir several times to combine and then turn off the heat. Note 1 - If you do not have chicken broth, just dissolve 1 chicken broth cube in 1 cup of hot water. Note 2 - To avoid mushy and limp veggies, just cook them halfway through. It will go on cooking while still hot even after removing them from the wok. Remember that it will also be returned at the last part of cooking. Note 3 - The pancit canton should be a little saucy once cooked as the noodles will keep on soaking up the liquids even after cooking.